Yamaha launches budget stereo amplifier and micro system | What Hi-Fi? The stereo amp follows in the footsteps of the award-winning A-S500, slotting in at a price of £230, while the micro system will go on sale for around £280. The A-S300 delivers 60 watts of power per channel, has an MM phono stage, pure direct mode, tone controls and a loudness control. There are six audio inputs, two outputs and a subwoofer output, plus support for connecting Yamaha's wired or wireless iPod dock. Developed in tandem with the A-S500, the budget amplifier's sound has been tuned for the UK and marks, with the '500, a new approach to sound for Yamaha. Turning to the MCR-550 micro system, and Yamaha is bullish about its aim of knocking the Denon champion from its perch. 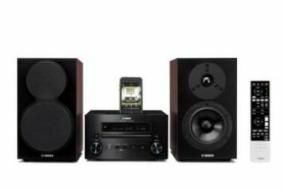 The system comes with speakers as the MCR-550 or you can buy the main unit separately as the CRX-550, for around £220. Outputting 32 watts per channel, the micro has an integrated iPod dock that takes a digital signal, a USB connection, DAB/FM radio, stereo minijack input and Yamaha's compressed music enhancer. Speakers are available in black, brown or white, while the main unit is yours in silver or black. We'll be carrying an exclusive review of the MCR-550 in the March issue of the magazine.